Join Bar Louie’s Crew to Receive a Free Appetizer at Bar Louie Fenway! Last week I received a really great tip on Twitter that I wanted to share! 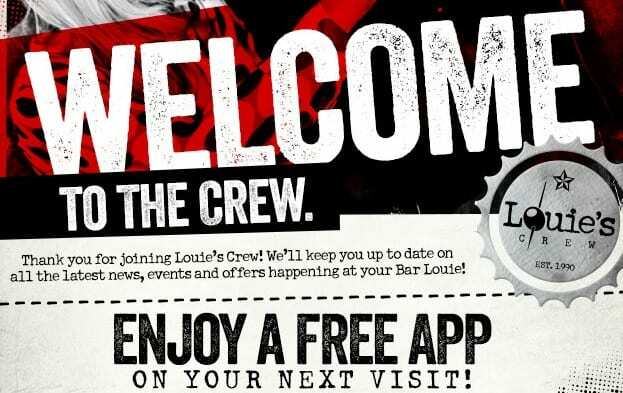 If you join Bar Louie’s “Louie Crew” with a valid e-mail address, you will receive a complimentary appetizer when you sign-up! Bar Louie’s newest location by Fenway is perfect timing for October baseball! 🙂 They also have a weekday Happy Hour from 4-7pm that will be added to the cheap eats list soon! I signed up for the Louie Crew online here, but it took 6 days for the offer to hit my inbox. My free appetizer expires on 10/30/13. However, I believe you can also sign-up at the restaurant to receive this freebie a little quicker! Go Sox!